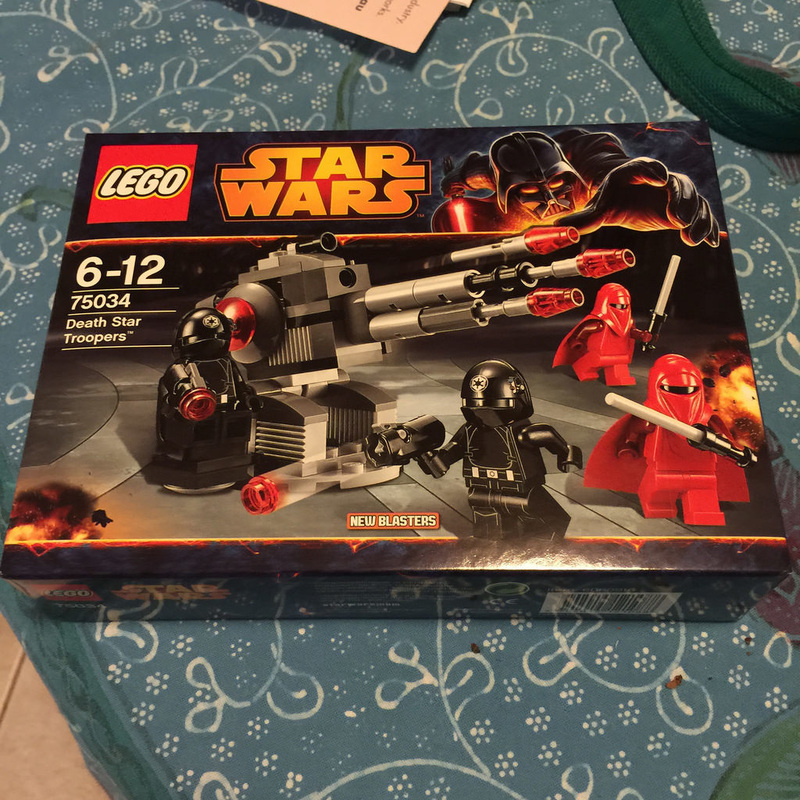 Although I really like the Star Wars themed sets, I don’t have that many of them, with this set being only my second Star Wars set. More to the point, I didn’t even buy this one! My brilliant wife bought it for me after a bad week to cheer me up. Needless to say, it worked! This set is known as a battle pack. Battle packs are small sets of under 100 pieces, with a bunch of minifigures from an army. LEGO advertises them as good for “building up your army”. Star Wars has a lot of battle packs, and they can be for droids, troopers, and more. Any army you can think of really! 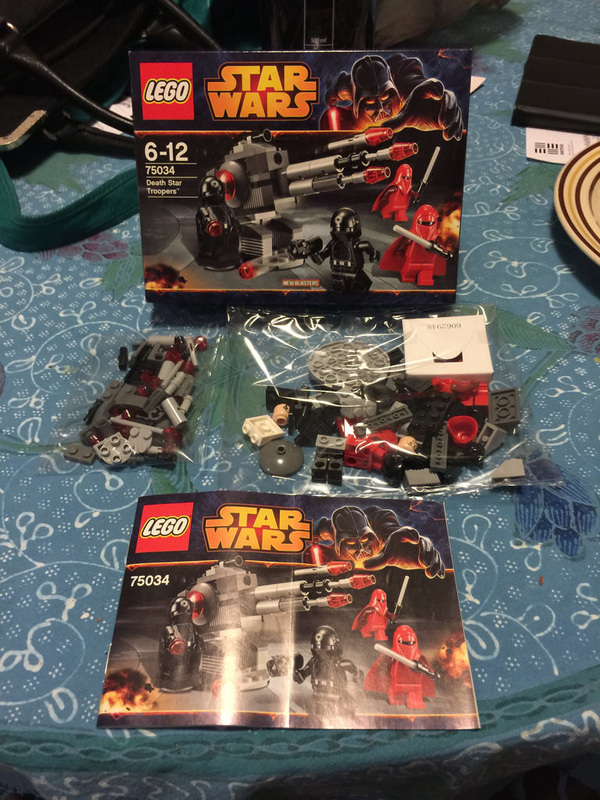 Out of the box with this one will see you get two parts bags and one instruction booklet. 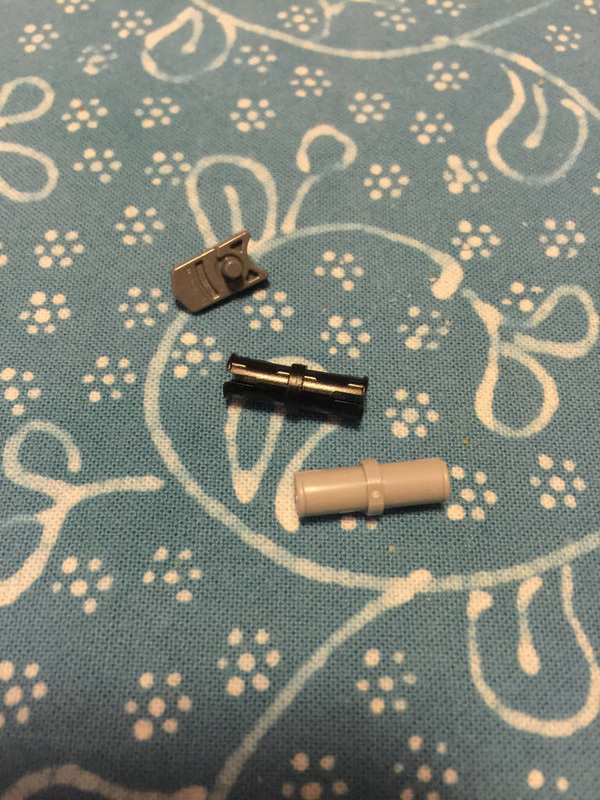 Aside from the minifigures, the parts in this set are pretty standard. The only part worth mentioning are the mini-shooters. I’ve never had these before, and I have to say, they shoot pretty far! The minifigures are the stars of the set here though. 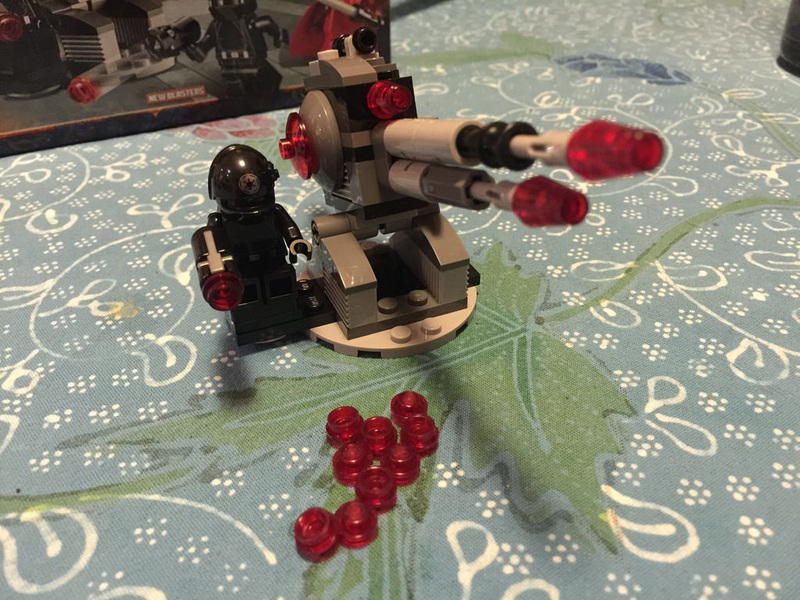 First up, the brand new Death Star Gunner. This guy’s helmet is new, as well as his torso. One thing I noticed after I set it up is that the faces of the Gunners are different. One has an open mouth, while the other is closed. The whole figure for these guys looks great. I’m really impressed. 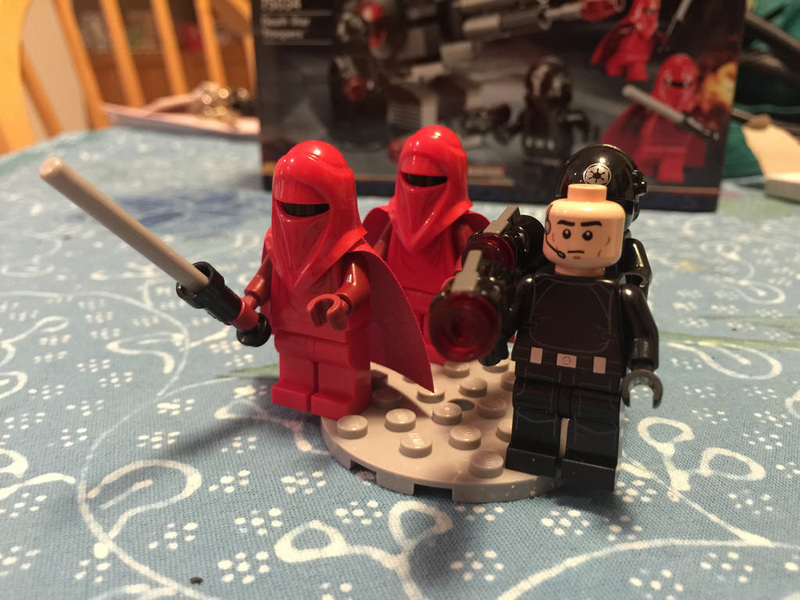 The other minifigure design is the Royal Guard. These guys are not so new, but they have had a bit of a redesign. The new variants have dark red arms and hands, as well as a force pike instead of a black spear. Their capes are also new, with a dark red colouring on the inside. I quite like these guys. They look rather imposing. Their heads are solid black with no printing. Spare parts are very minimal on this build, with a couple of spare Technic pins, a mini-shooter trigger, and a whole bunch of ammo (transparent red 1×1 round plates). The cannon itself looks quite cool, but the flick-fire mechanism on mine is abysmal. It’s not so much a flick fire as a push fire, using a Technic axle to push the pin out the front of the cannon. It results in a very poor firing distance, not making the end of the cannon. The rest is pretty simple. It moves up and down, and the gunner’s chair swivels, but with no controls anywhere near it. It looks kind of cool, but that’s really it. The next review will be 60084: Racing Bike Transporter. Don’t forget to like and share on Facebook!